You will be given a reference e-book to read which has 703 pages And the test will be based on that e-book , you can take final test within 1 year of purchase. What is Android Wireless Application Development? Android wireless application development, as the name suggests, involves the process of efficiently and accurately following the most useful steps linked to the development of wireless applications that you can use for Android. This requires you to access a comprehensive guide which talks about the whole development process to increase your chances of establishing the most commercial grade, robust, entertaining and functional Android wireless applications. It should be noted that if you wish to become one of the most renowned Android developers at present, you need to familiarize yourself about all the concepts and strategies linked to the development process so you will find it easier to satisfy the public with all the wireless applications that you have developed. You should focus on completely understanding the most advanced techniques that you can use to efficiently undergo the whole application development cycle including vital stages such as coding, design, debugging, testing and distribution.? As an aspiring Android wireless applications developer, you also need to familiarize yourself about the major principles that are now used in designing Android applications. You need to know about the whole design process as this is the only way for you to create the cleanest apps that will surely give users a more enjoyable time navigating them. You need to access a more detailed coverage about all the keys in the Android API such as those that are linked to networking, data storage, multimedia, location based services, hardware, 3D graphics and telephony. 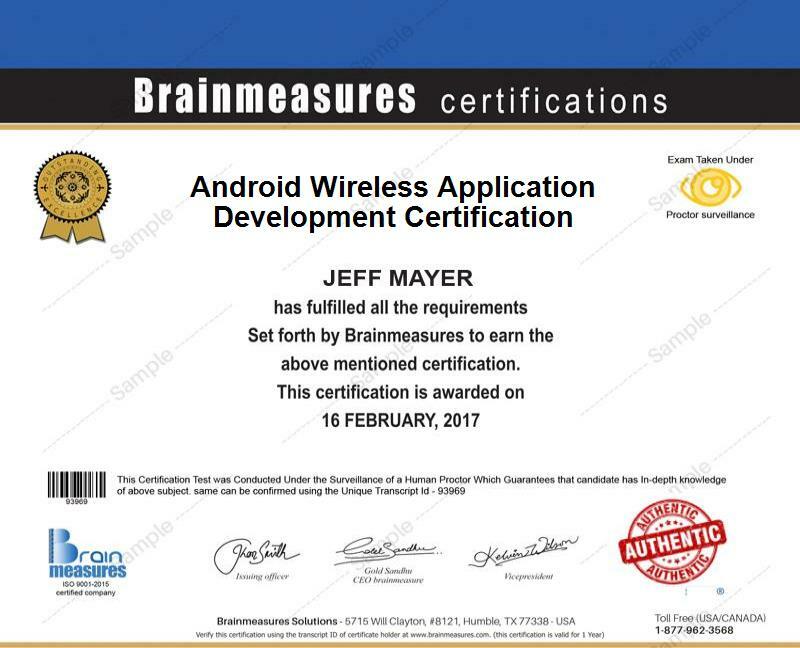 If you really have a strong desire to become an effective certified Android developer, then be aware that Brainmeasures, with its Android wireless application development certification program, can offer you the kind of help that you desperately need. This Android wireless application development course is proven to be really useful for you since it works not only in supplying you with information about the whole app development process but also in making sure that you absorb everything that you have learned from this online certification course and apply them correctly into actual practice. This certification course allows you to enjoy a fully detailed Android wireless application development training which increases your chances of completely understanding the whole wireless application development process for Android, the major principles that are now used in implementing it, how to apply your theoretical knowledge into actual practice especially once you start to develop your first Android apps and the most advanced strategies and tools that will surely help you during the development stage. Earning an Android wireless application development certificate is indeed very rewarding since it lets you understand even the major complexities of the app development process. More and more people especially aspiring Android app developers are now enjoying all the benefits that the Android wireless application development certification program from Brainmeasures offers. This certification program actually targets all Android app developers, programmers, designers, analysts and any other professionals whose job involves the development of Android apps and making sure that these are robust and functional enough. Your chances of improving your financial stability are also dramatically increased as soon as you complete an Android wireless application development certification course. With the presence of your certificate, you will find it easier to work as an Android wireless application development consultant and receive an average yearly salary of $87,000. Working as an Android wireless application developer also entitles you to get around $62,000 to $146,000 a year.